More raw(ish) meat on my blog! I promise this won’t become a running theme, either literally or figuratively. I just had to post this recipe – I made this for a shoot a few months ago and now I’ve been coming back to it in my head for days now. I’m sure it’s the combination of still being in beach mode and having Cinco de Mayo coming up today. While I was on vacation in St. George Island, we were inundated with fresh seafood. Fresh shrimp purchased from the side of the road and made into a shrimp cocktail lunch. Huge, plump raw oysters and steamed crab legs at the dive-y raw bar around the corner. It was just incredible…and it’s a way I would like to eat all the time. While I do live in a major city and have access to all varieties of foods, the freshness of local seafood is something you just can’t replicate – even when you pay $17.99 a pound for it at Whole Foods. 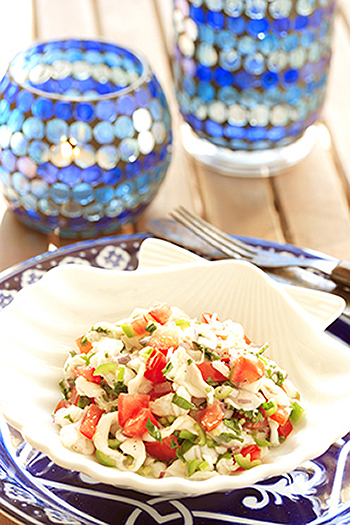 A really easy way to have that brightness of flavor and the ease of a warm-weather dish is ceviche. When I made this batch for the shoot several months back, it was the first time I had made it myself. I love ceviches of all sorts but always had trepidation about balancing the acid and the heat and all of the flavors in between. Those fears were truly unfounded – it couldn’t have been easier. I love calamari/squid in my ceviche, so I added that to the cod fillets I used. While this recipe makes a LOT of ceviche, you can easily cut it down and eyeball the amount of lime juice or acid you use to "cook" the seafood. You can also easily adjust the heat by amping up or minimizing the peppers. Add a glass of crisp white wine and some Saltines to this and you’ve got a divine (not to mention low fat and – without the crackers – low carb) summer meal. – Dice fish into small pieces approximately an inch in size. Place in large plastic or glass bowl – it doesn’t need to be shallow. – Using a lime juicer, add the juice of all 24 limes. Marinate for 1 to 1-1/2 hours in the refrigerator. Dice onion, tomatoes, and Serrano and add to the fish mixture. Stir in salt and cilantro. Cover and place back in refrigerator for at least 30 minutes to allow flavors to mix. We use this for parties and family gatherings. Recipe may be made smaller by reducing ingredients to half or one third of original quantities. Remember to use 7-8 limes per pound of fish. The bottled lime juice may be used, but it will not yield the same result. It adds a concentrate sweet/bitter flavor to the dish and is not as good as fresh squeezed. P. S. The "juice" of ceviche is called "Tiger’s Milk" and is thought to increase virility and cure hangovers. Thanks to Tony Clark for sharing in this amazing meal we made that day and for taking such beautiful photos of it, as usual!!! Just found your blog…love it! Obviously we’re very interested in local food, and I look forward to your future posts. Mmmmm. I love ceviche. You can buy a tiny little bit of fish and a scallop or two to make a really lovely dish just for yourself or as an amuse-bouche for not much money. Delicious looking as usual, and a good light, easy-to-prepare dinner for these warmer evening meals. The correct balance between the lime/lemon and the heat is what is important and this recipes seems to nail it.